Contemplations of Miro is one of Ingrid’s most recent abstract works. There is wonderful movement in the painting as the amorphous figures seem to float and dance on the canvas. Using paint and resin, the shapes appear to jump from the canvas. The shapes evoke a feeling of strange sea creatures or perhaps as viewed under a microscope. The bright colors are evocative and there is a welcoming, whimsical sense to the painting. As in all of Ingrid’s work, layers are integral to her creations, Contemplations of Miro is no exception. The large shapes are the first thing the viewer sees, but as we continue on one starts to see tightly written poetry flowing throughout the painting. There is a sense of reading the poem without actually reading it, more like absorbing the essence or the raw emotion of the poem. As we look deeper, we see faint rings of paint. These fine lines lead our eyes around the composition subconsciously. Again another layer for the mind to discover. It is a kind of three dimensional dance on a two dimensional surface. And the longer one looks, the more one sees. It is a work that one wants to pull up a chair in front of, get comfortable and just…look. Contemplations is an apt title for the work. This work and other beautiful abstracts are now showing at Galerie Zuger in Vail Colorado. Here is the official Press Release for the upcoming Exhibition in Vail this week. We are excited for this Thursday, hope to see you there! 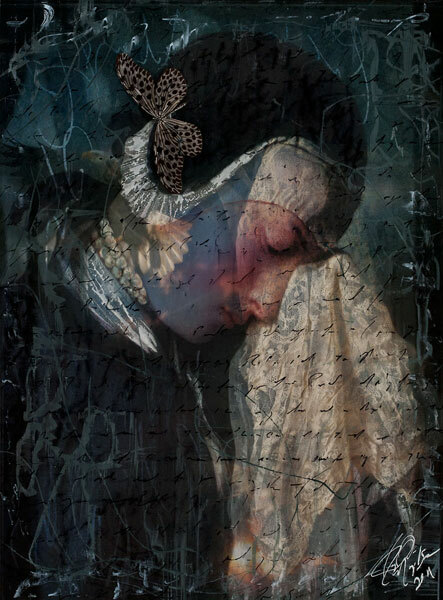 Magidson mixes modern materials and renaissance images to capture what she calls “the illusory nature of time.” In the piece “The Butterfly Effect” Magidson presents a beautiful renaissance woman in a classic pose. But she is ghostly and transparent. One can see through the subject into the layers beneath. Butterflies hover in and around her as if in full flight. 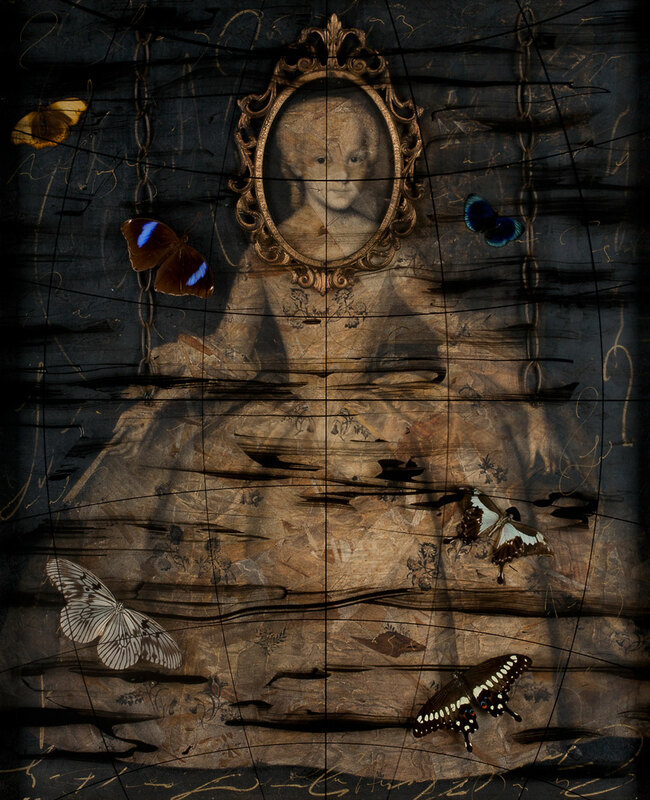 Images, musical sheets, antique jewelry and manuscripts can be seen through her. The more the viewer looks, the more is revealed. To create this floating effect, Magidson uses layers of acrylic, collage and objects in a kind of three dimensional assemblage or transparent canvas. As the viewer moves around the artwork, hidden objects reveal themselves and others disappear. It is a kind of reverse illusion; what appears flat is actually three dimensional and the objects that are three dimensional appear flat. Once involved, it is difficult to look away. There will be two receptions with the artist in attendance, Thursday, July 5th and Friday, July 6th from 3 to 7pm both nights. The exhibition will continue for two weeks. Galeryie Zuger Vail is on the second floor of the Solaris building in the heart of Vail, Colorado. Here is Ingrid’s newest piece, “Set Me Free.” Another masterpiece.